Two Tip Tuesday – More Hexies! #1 – Go with your gut! I just wasn’t happy with using my inspiration fabric in the border, some quilts don’t need a giant border. Let it talk to you and be done! BTW, the inspiration fabric was used as part of the pieced backing. 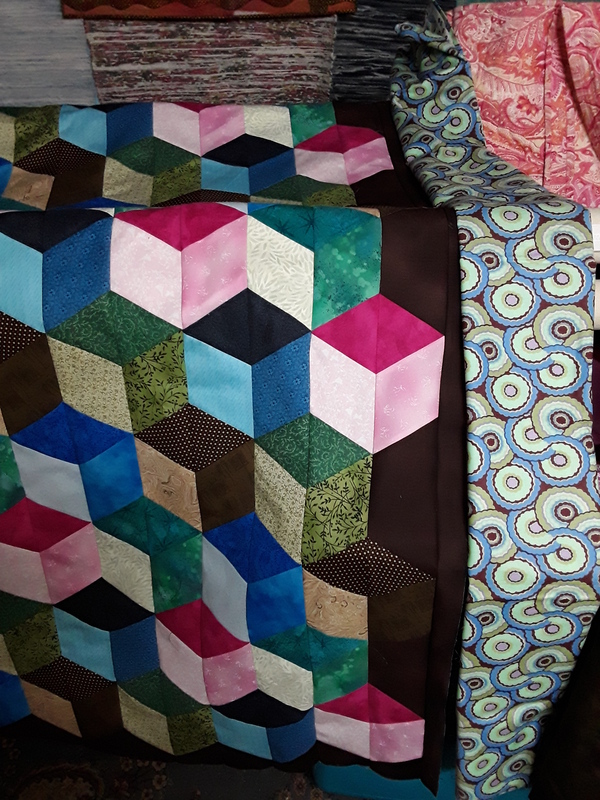 Several student’s quilts from the Hex-a-ma-jig workshop about a month ago showed up at the Getaway. 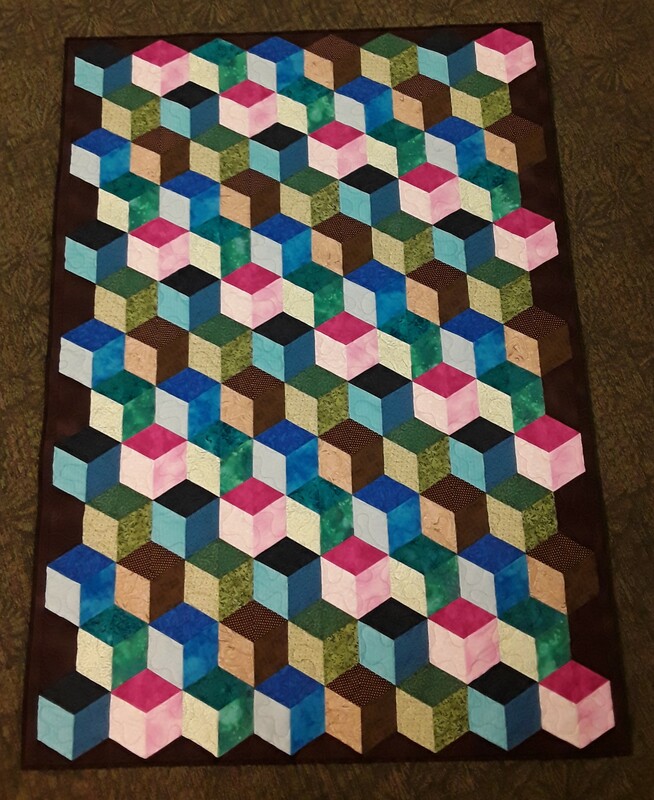 Another super job by Kathleen L. and her Hexie quilt is DONE! I love how the brights sing! Two Halves Make a Whole by Kathleen L.
I started another Hexie quilt, but this time a using Hex-a-ma-jig to cut FULL hexies and triangles. 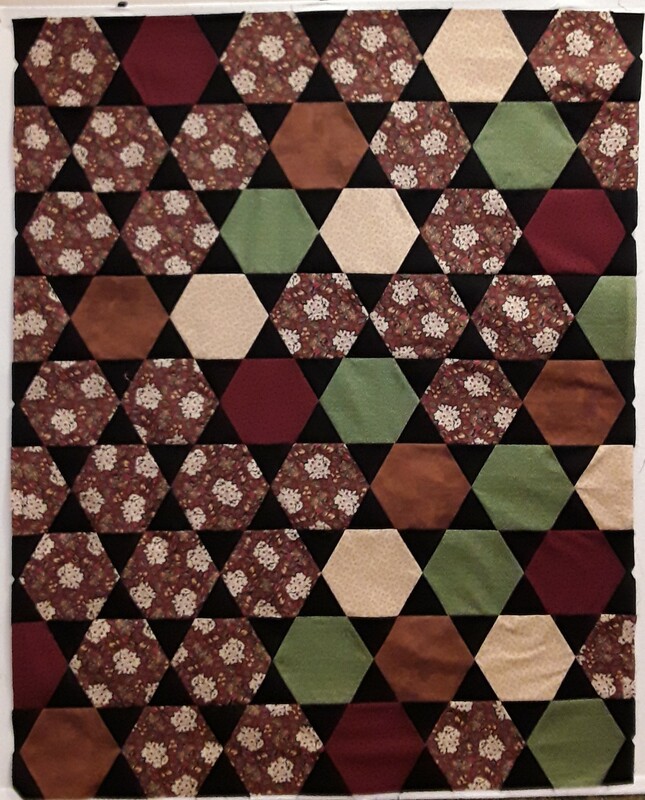 I used triangles between the full hexies so I did not have any set-in “Y” seams. 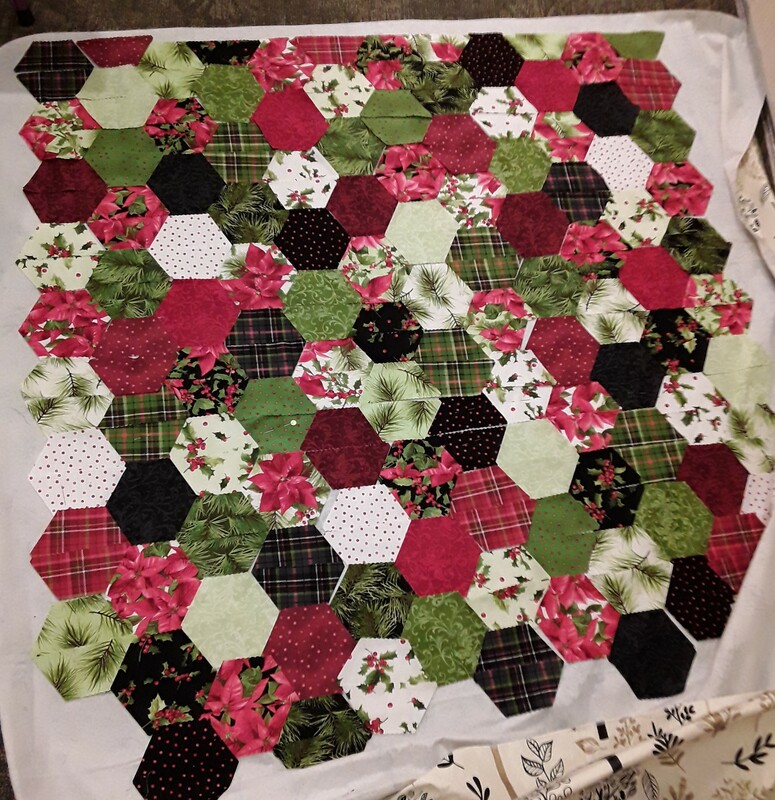 It was quick and easy with the large full hexies and I got it pieced together! It sure helped to use my portable design wall. 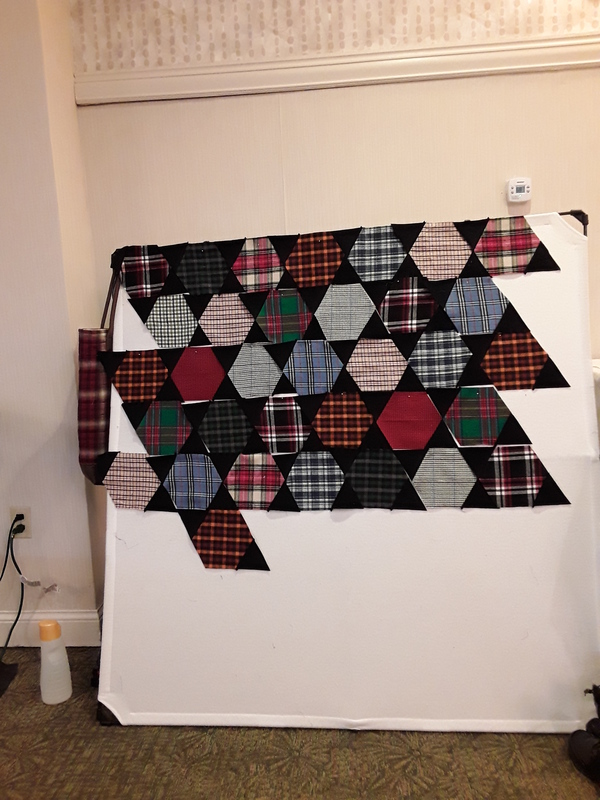 Here is a start Priscilla’s flannel version using full hexies and triangles. LOVE those plaid flannels! This design really shows off the fabrics. I also love how she used the black at the edges to float the hexies. She borrowed the use of my portable design wall<grin>. Bonus idea…the repurposed creamer bottle on the floor was used for water for the iron! 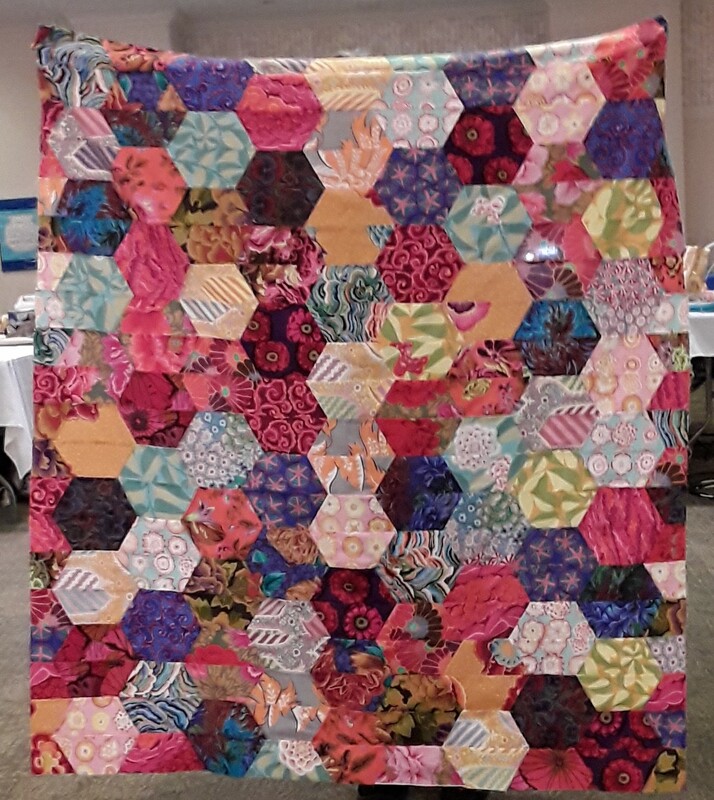 Full Hexies by Priscilla M.
#2- A Portable design wall is great for Getaways (or Retreats or Workshops). Much easier than working on the floor. The Portable Design Wall is now sold by Off The Wall Quilt. I like how they easily fold up and have their own carry bag. 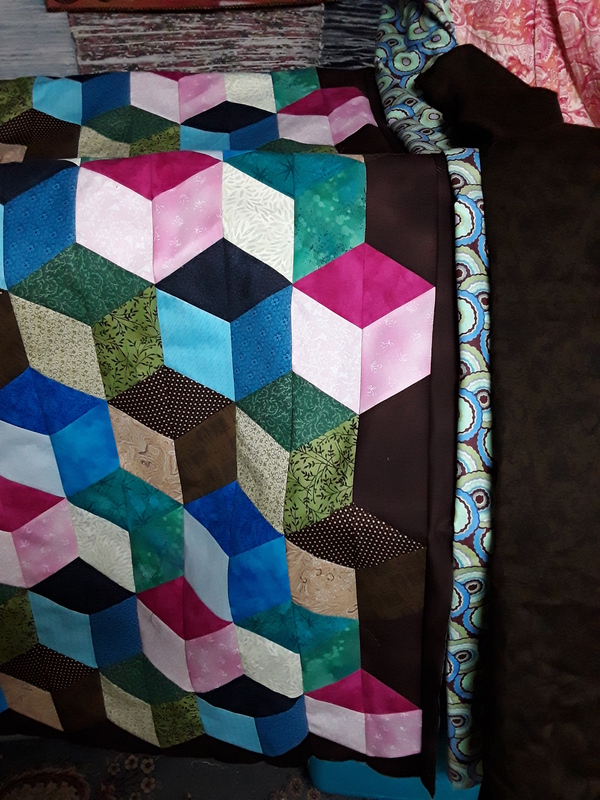 Two Halves Make a Whole by Nancy B.
I’m loving all the quilts using both versions of Hex-a-ma-jig!! It is great to have a quilty tribe!!! This past weekend, I attended a sew day that Pam Machamer of Twin Maple Studio hosted. The day was organized to help Janet-Lee Santeusanio reach her goal of 25 Quilt of Valor for MQX. Pam already made a quilt. We were making blocks to make more of the same. 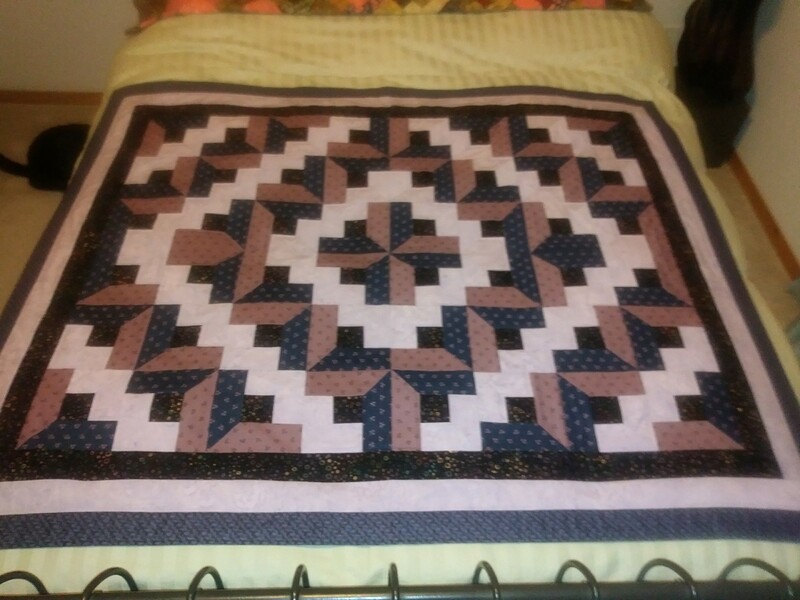 The quilt uses large 6″ finished half squares. The pattern “Homeland” was designed by Candy Hargrove and is available at mccallsquilting.com. It was published in their July/August 2017 magazine. 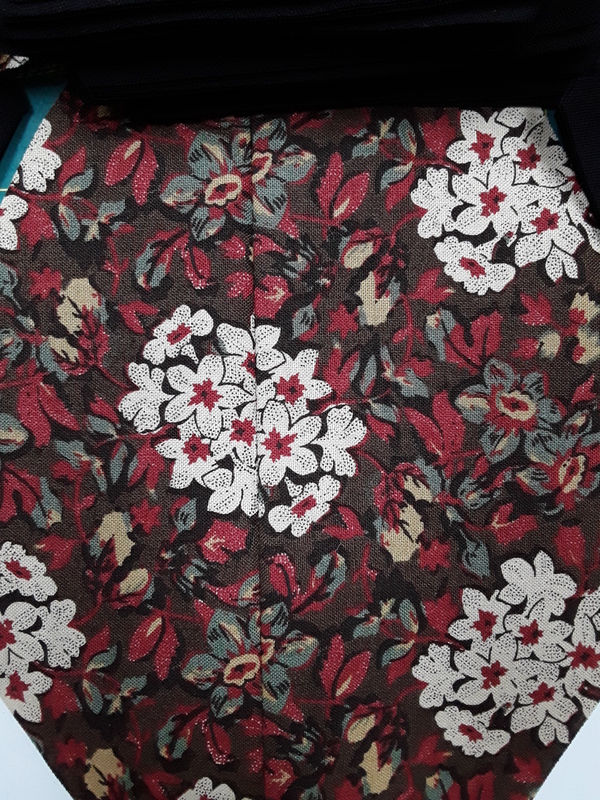 Here is Shirley Tetreault’s partially finished quilt! I worked on a scrappy version. 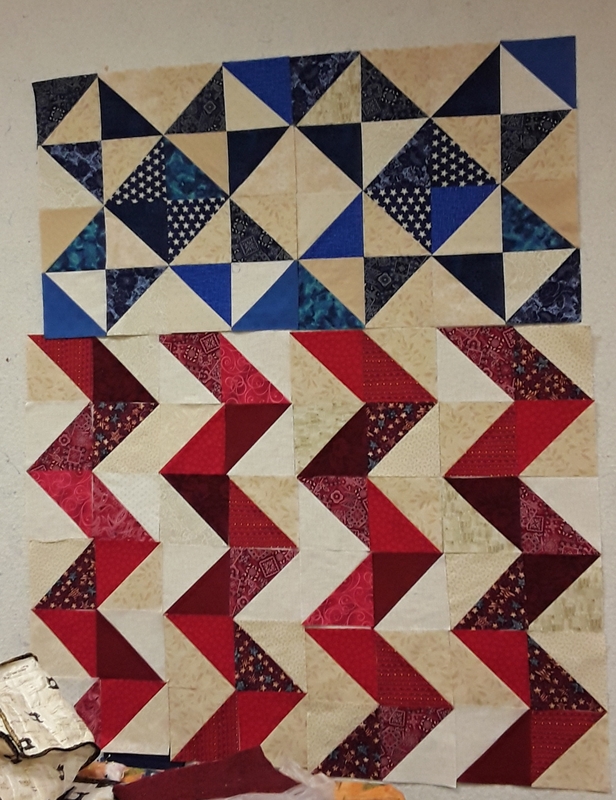 Thanks to others who already made the half squares, I was able to jump in, put blocks on the design wall and start sewing!! Have you made a Quilt of Valor? 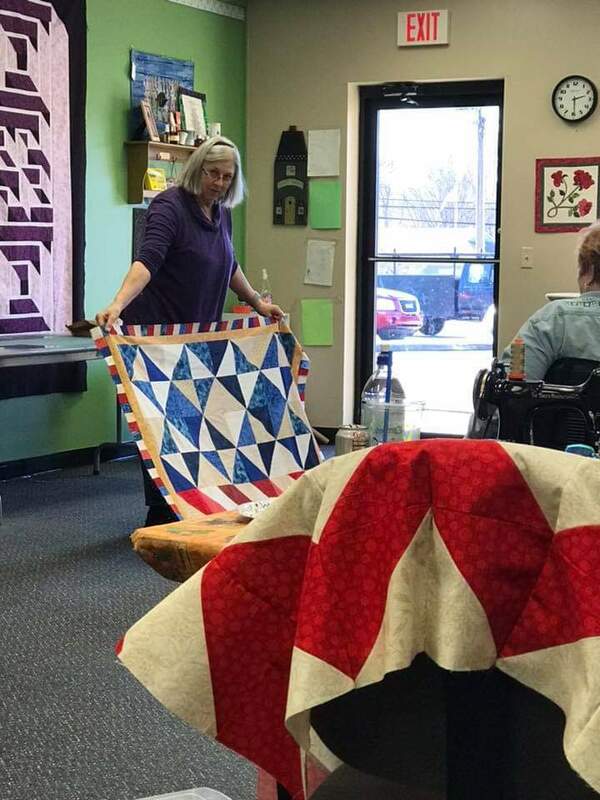 I’ve made several over the years and love that the organization is very active in getting quilts to our service members and veterans! Their website is qovf.org. 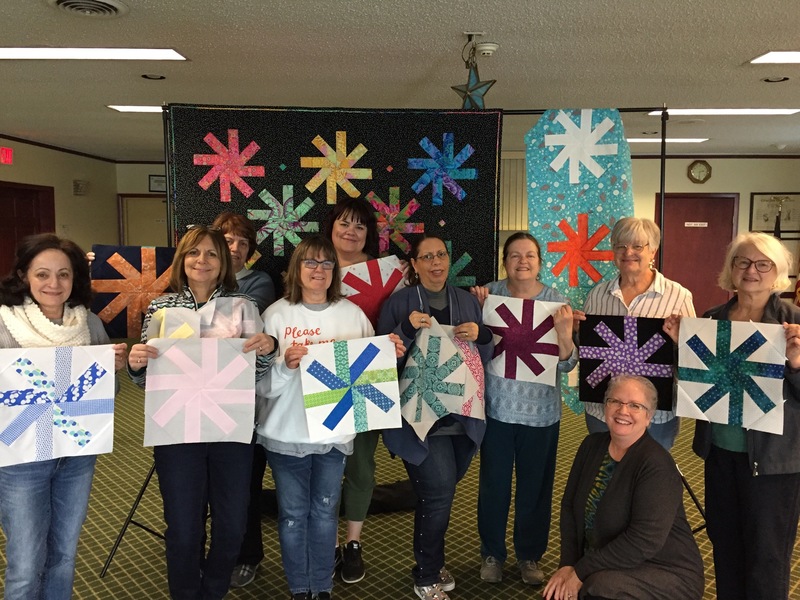 #1 – Make a Quilt of Valor! 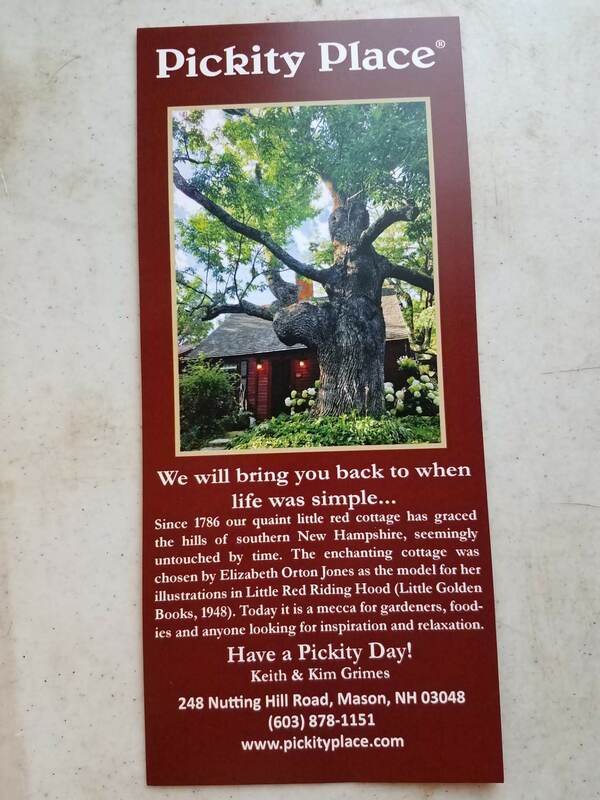 It is a tip, REQUEST, to help a very worthy organization! #2 – Try making 8 half squares at a time. Quick and easy! 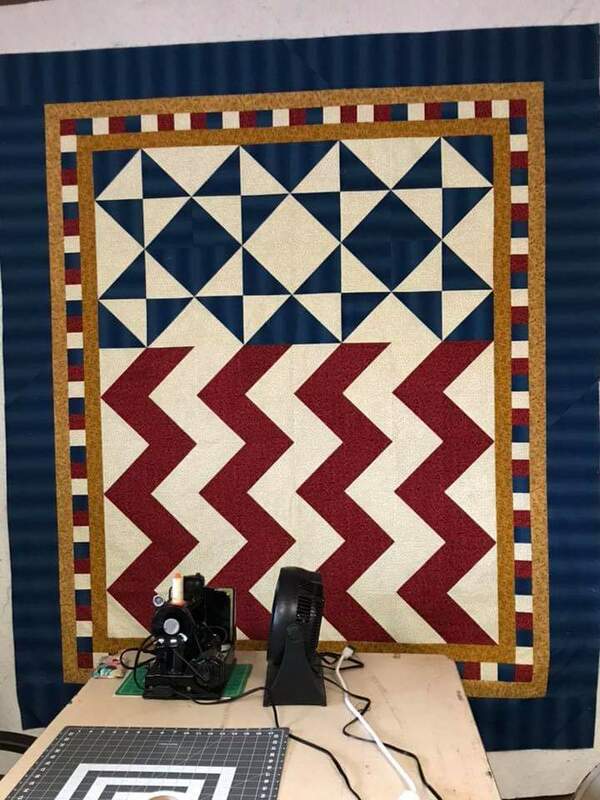 If you can make a Red White and Blue quilt it would be wonderful! Did you know I travel to give lectures and teach? I DO!! Yesterday, I gave a lecture/trunk show on the Egyptian Tentmaker’s Applique for QUILT North guild in Clifton Park, NY. Today, I taught “Twirl-A-Tool” Workshop using “Brilliant Bindings” as a cutting template.” I do believe FUN was had by all! Photos below! 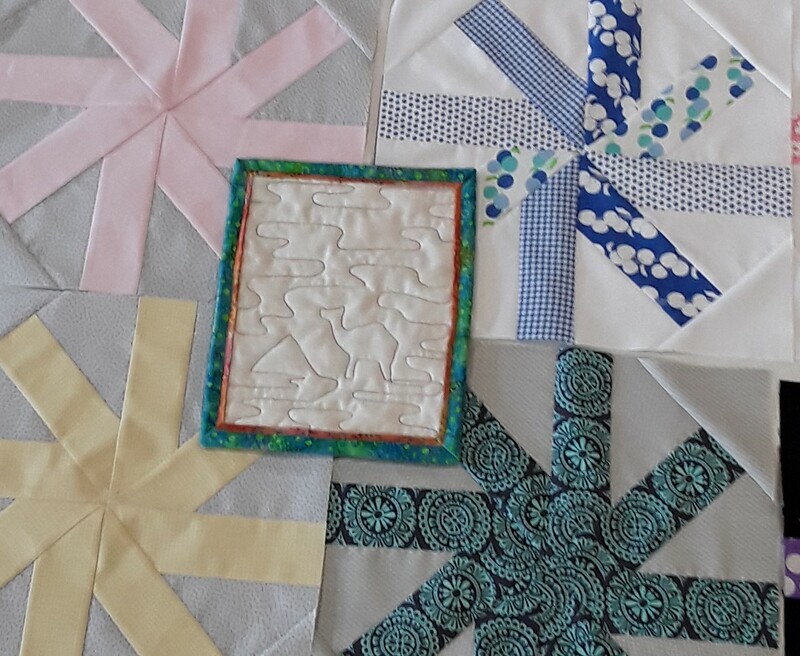 Most of the students got 2-3 blocks finished in class and a faux piped binding put on a small quilted sample. The quilted sample just had to have a camel and pyramid on it! It was a great group and I, too, had FUN! If you are looking for a speaker or teacher for your guild, please keep me in mind. I have bags and will travel! Some tips we discussed in class…what do you do when your teacher didn’t triple check your work and had you cut wrong? ?…She takes off your entire binding so you can start again. I do know how to use a seam ripper and I’m happy to help. A nice fine point seam ripper is my preference. 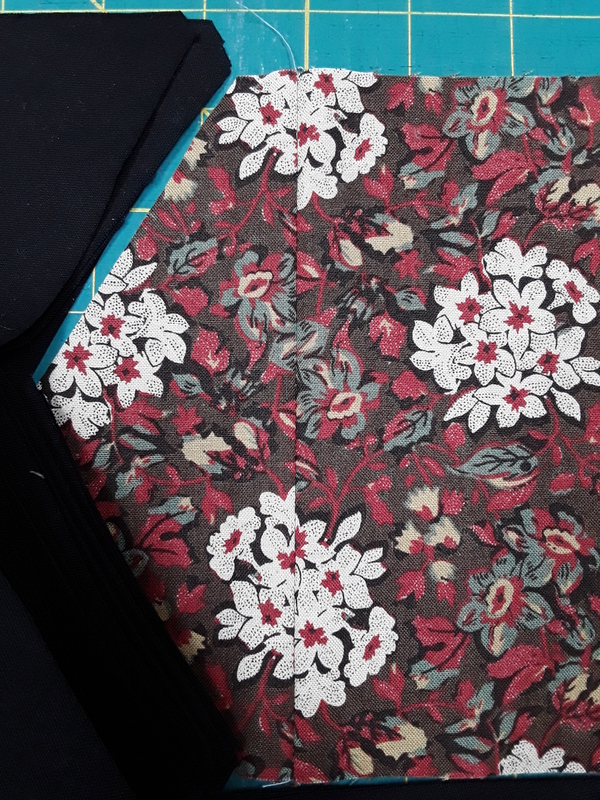 A fine point for lifting the stitch, the ball helps protect the fabric and the U-shape blade between the point and ball is where you cut the stitch. Don’t just pull at the stitch, slide the thread down the blade so the stitch is cut with the U-shape blade. Otherwise, you are plucking at the stitches, not cutting them. #2- If you get frustrated, hand your piece to someone else. I’m guessing they will happily help you rip out some stitches. And my “rule”…I’m not ripping more that three times, it can stay in. You are likely to starting ripping apart your fabric. On another note, look at all the wonderful blocks that were made in class. I’m very proud of the work that was accomplished today!! Many of us are in a deep freeze. Those of you in warmer weather, ENJOY! 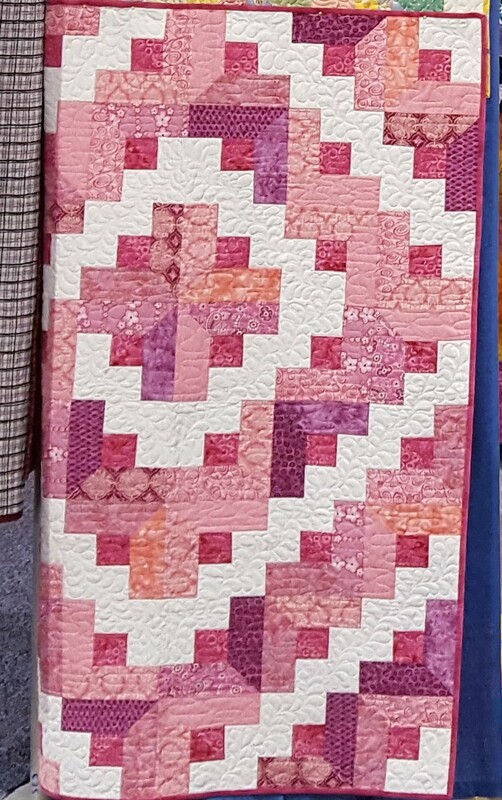 I’m looking forward to the AQS Daytona Beach Quilt Show the end of next month. It will be good to be in the sunshine with short sleeves. Here in New England, we have sun today but brrrr! It was 10 degrees when I left the house this morning. Snow and sleet had me slowblowing my driveway a couple days ago. If I had to be out in it, how about making quilting designs! I shared this on Facebook so some of you saw it already. But, worth repeating! 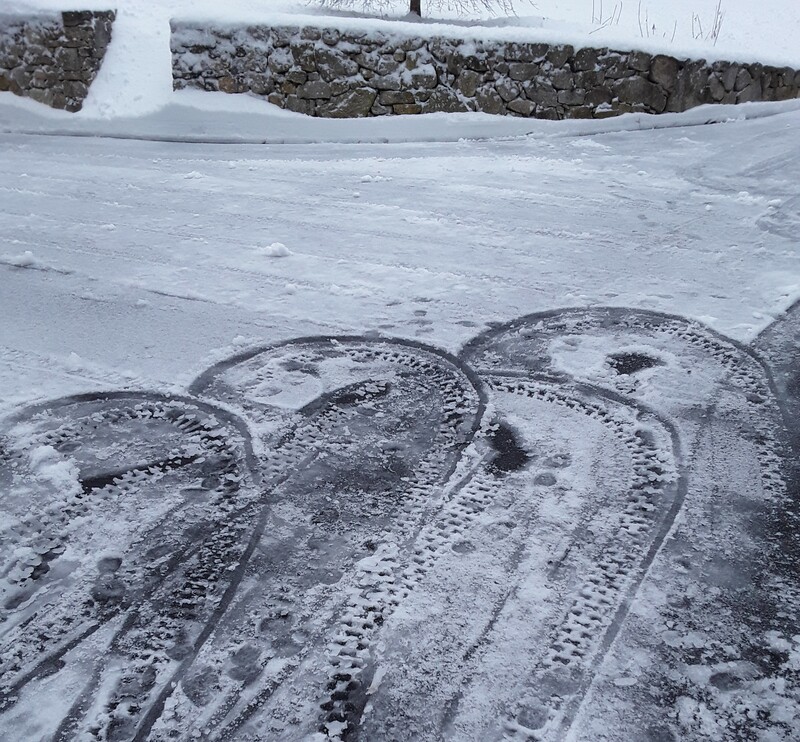 I thought about doing the whole driveway, but the cold (1 degree that day) sent me inside as soon as I finished. Clam shells in the snow! I’m working on a challenge for one of my guilds. 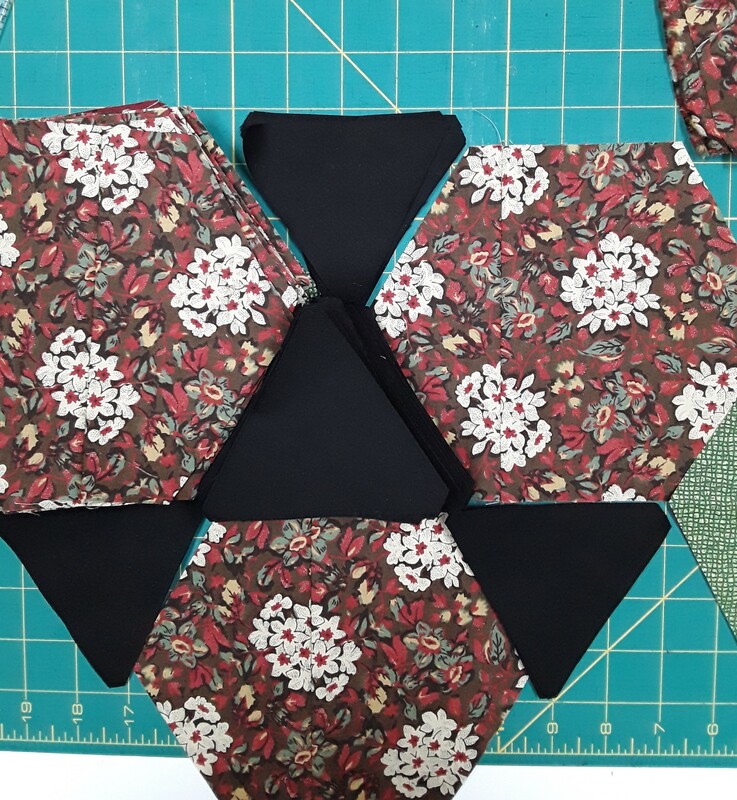 I started cutting full Hexies with Hex-a-ma-jig and ended up short on fabric. (We swapped 1 yard, so I had limited fabric.) I wanted just a few more Hexies so, with the extra fabric, I pieced the leftovers and cut a few more! Can you see the seams? #1 – Piece together leftovers to make a larger scrap to cut more! #2 – Match if you can. If it doesn’t match, oh well. Use it anyway! Look at the antique quilts, I bet there will be many pieced together spots. We like it on the antiques, so why not on yours?!? As the title suggests, what do I tackle first? I have so many ideas and projects, I need my word from last year, FOCUS! I think I might try to finish up some unfinished quilts from last year. I even have a new pattern that is almost written but it needs the cover quilts quilted. Yep, that should be first! Do you ever get in a quandary of what to work on? I believe that is what I do best. As a dear friend once said to me, not all you started has to be finished. Shew! Good thing around here. She also said, You learn something with just starting a project. Sometimes just picking fabrics is all you needed to do with that project. (She, is a VERY SMART friend!! Hi Barbara!) No matter what I’m doing in quilting I enjoy the process. I’d enjoy it even better if it was done….wink, wink! So, with that, I need to get started on my lists. #1 – Make lists of what you need/want to finish. 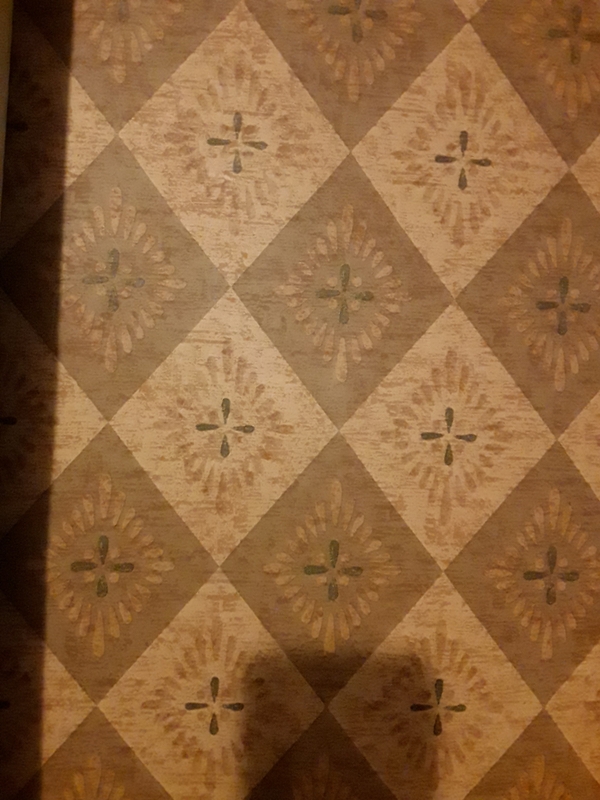 Cross off when complete. That is such a GOOD feeling! I’m planning on bringing out the quilt I talked about above for Spring Market. This one is back to using Brilliant Bindings as the template for cutting the trapezoid shapes. I’ll be posting in the next few weeks peeks at the quilt. Stay tuned for the pattern release (you’ll be the first to know!). Brilliant Swirl by Jody S.
My aunt does excellent work! #2 – Change a blocks coloring. You might be surprised what outcome you get! Case in point above! 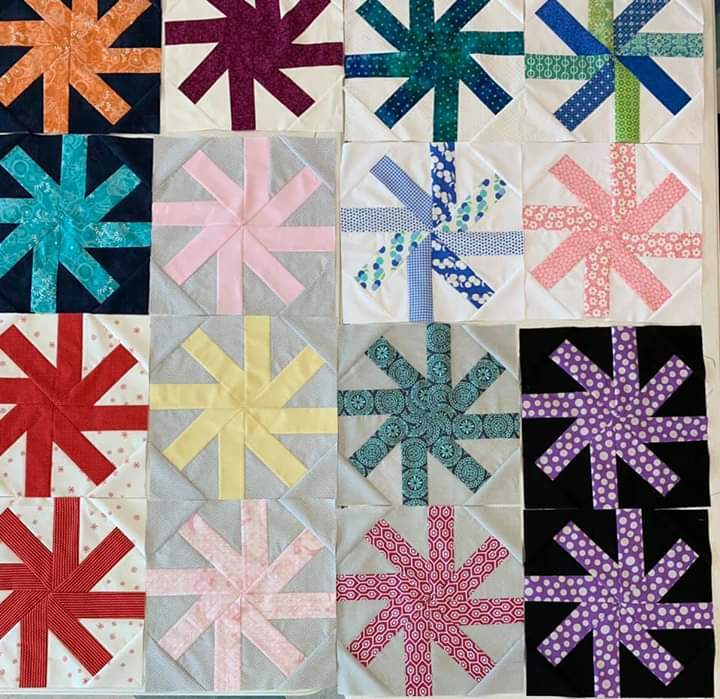 Have you made any quilts lately with my patterns? Please send me photos! I’d love to feature your quilt here on my blog. Now off to cross something off my list….